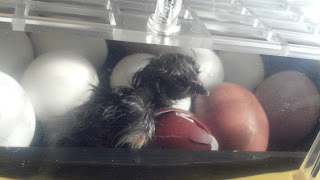 The Farm at Beaman's Fork: LIVE Eggs Hatching! Here we go again! Watch our eggs hatch LIVE right here all weekend... we will be periodically updating this post with the latest progress and keeping the camera pointing on any current action. We have 27 eggs in our Brinsea Octagon Advance incubator, including the following breeds: Black Copper Marans ("BCM" x8), Olive Eggers ("OE" x5), Black Copper Marans Cross ("BCMX" x5), Araucana (1), Cochin (x2), Standard Silkie ("SS" x1), Silver Phoenix ("SP" x1), Red Shouldered Yokohama ("RSY" x2), Mixed Lgt Brown Layers ("MIX" x2). PIP: Hatching term meaning that chick has punctured the egg shell with its beak to make an air hole. Egg may stay this way for several hours. During this time the chick is absorbing the last of the yolk. Peeping is commonly heard now. ZIP: Chick is actively chipping away at the shell (usually in a straight line). Hatching will follow soon. HATCH: Chick is actively emerging from egg. 3/24 11am: BCM #2 HATCHED <-- first chick of weekend!